Wild rainforests, enigmatic cities, street-art alleyways, and cinematic beauty on your doorstep is the stuff of dreams for many, which is why Australia is one of the world’s top expat destinations. Just in case you needed some reasons as to why Australia’s a great place to expatriate to, here’s our top five. Australia is the world’s sixth largest country, after Russia, Canada, China, the USA, and Brazil, as well as being the planet’s largest island. There’s plenty of unique places to visit and things to do, meaning you’re only steps away from an adventure. You can take trips to explore the Great Barrier Reef, spend time in glamorous cities visiting art galleries and upbeat cocktail bars, camp under the stars in perfect silence, take a trip to a ski resort and work on your skills, be a tourist and take pictures outside of the Sydney Opera House, or just head somewhere remote to spend time on a white-sand beach with a good book. Not forgetting the wildlife out there, from untamed kangaroos and wallabies roaming the land, to rugged mountainous terrain with birds and flowers perfect for those keen hikers. There are a number of great cities in Australia for people in all different stages of life. If you’re into adventure, you may be drawn to Cairns for its water sports and wildlife, while Melbourne might attract the foodies, the art lovers, and the music fanatics. Sydney might draw in those looking for a mixture of an active nightlife and relaxing beaches to recover on. Meanwhile, Brisbane offers expats tropical temperatures, sports galore, and a fabulous city to boot. Darwin appeals to those looking for a mixture of cultures, but the whole of Australia is very multicultural. Around 43% of Australian citizens have either been born overseas, or have a parent who was. Whatever city you move to, just remember that the weather is significantly hotter (cities in the south can even reach 42 degrees! ), so make sure you’re new home has air-con! With a variety of selection of cities, the nation also has a much lower population density than that of other nations such as the UK. In fact, it’s been reported that Australia has the lowest population density of any continent in the world, with around 6.4 people per square mile. So, if you fancy moving somewhere with fewer people and cleaner air (it has one of the lowest levels of air pollution in the world), Australia should be at the top of the list. Australia’s known for its laid-back lifestyle where everyone’s friendly, people say ‘Hi,’ to you in the street, and you can chill out after work with a cold beer and a Barbie (barbeque). But did you know that Australia’s healthcare system is ranked as one of the world’s best? Medicare provides a basic level of health cover for Australians, and there’s a private healthcare set-up too. Australians are generally quite active and with so many activities and sports to get involved with, it’s hard to find a reason not to be. There’s plenty of space for sports centres and grounds, and even schools have gyms. 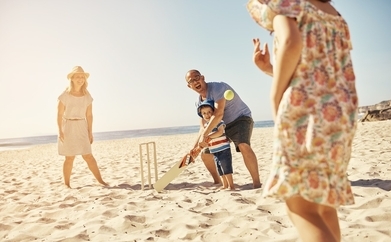 Cricket ovals and football spaces are so common in most towns and cities, and there are so many things that you can be active with. So, if you’re seeking a more active lifestyle, you might want to trade in your UK New Year’s gym resolution in cold and rainy January for sunshine motivation somewhere beautiful. If you’re looking to move overseas and want to talk to a currency expert about your international money transfer, speak to FC Exchange! Their dedicated team can help you make informed decisions about the best times to trade. So, whether you’re buying a sunny city apartment in Melbourne, or just need to make some regular overseas payments, they’ll be able to help. Contact us on +44 (0)20 3856 8011, or visit our personal money transfer page, here.